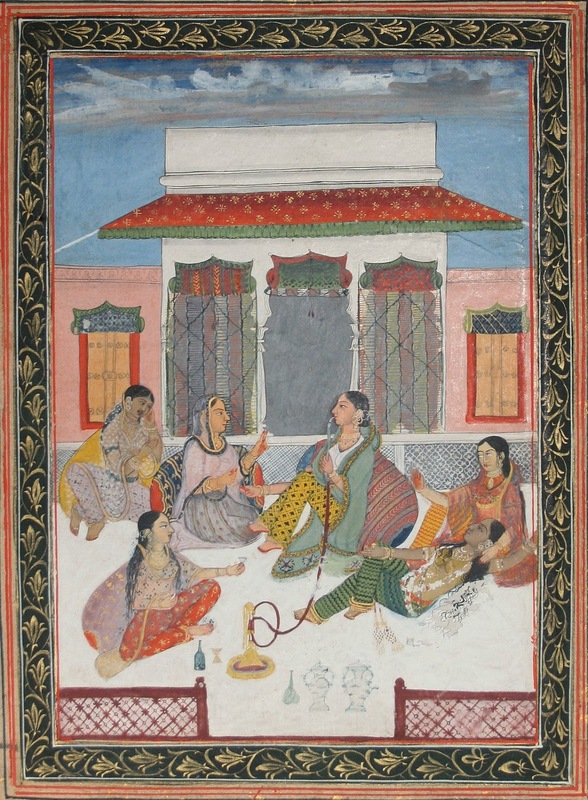 On the terrace of a kotha (where courtesans entertain clients) pavilion, the central figure of a naika (approximating a brothel madam) smokes a huqqa. Around her tawaifs (courtesans) sing as part of a Nuth Uterwai ceremony in which the reclining young virginal woman wearing a flower garland will be deflowered and hence initiated into her new profession. The folio was at some time after its production inscribed on front and back with fanciful attributions: below the inner borders red Persian script "Pashahi Zadeh badr al-nisa Begum"; at the foot in English: "No.40 Budoorul Nisa Begum of Bagdad"; on the reverse: "Pashazadi Badranisha". Each is a reminder to dealers and collectors of the problems inherent in inscriptions on Indian miniatures which were often added at a later date and as nothing more than guesswork entirely without foundation. Perhaps in this case a dealer hoped the painting might more easily find a buyer if it was showing not a courtesan but a more exotic Oriental figure, a begum of Baghdad.